The clean up continues after flooding caused disruption in parts of Northern Ireland after more than a month's worth of rain fell within a few hours. The Met Office said Belfast International Airport recorded an "incredible" 88.2mm of rainfall on Saturday afternoon. The figure was more than the average rainfall for the month - 81.2mm. On Sunday morning, NIE said power had been restored to all homes and businesses. An emergency flood relief scheme has been activated for those whose homes were damaged by the floods. Homeowners affected by "severe inconvenience" can apply for payments up to £1,000 from local councils. In Lurgan, the Soye Crescent estate off the North Circular Road experienced serious flooding. One of the residents, Terry Mallon, said he and his neighbours were stranded. "Nobody could get in or out. Your only option was to walk through the water, which was knee deep. "A few of us went out into it to push cars out of the water on to higher points but most people stayed inside. "The water was stinking - the storm drains overflowed so there was raw sewage and rubbish everywhere." 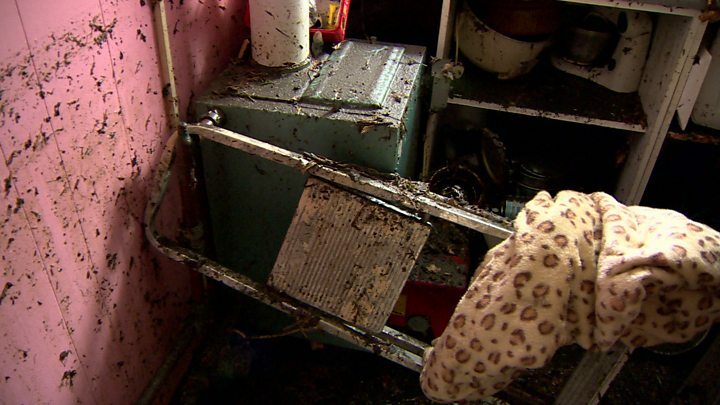 Mr Mallon described the estate as "a mess" after the water subsided. "The gardens are ruined, the ground has been lifted off in parts and it stinks." David Carson, who lives on the Steeple Estate in Antrim, said his house flooded within 10 minutes. "The road at the back of our house is slightly above the rear garden. I looked out shortly after the rain started and it was like a river. 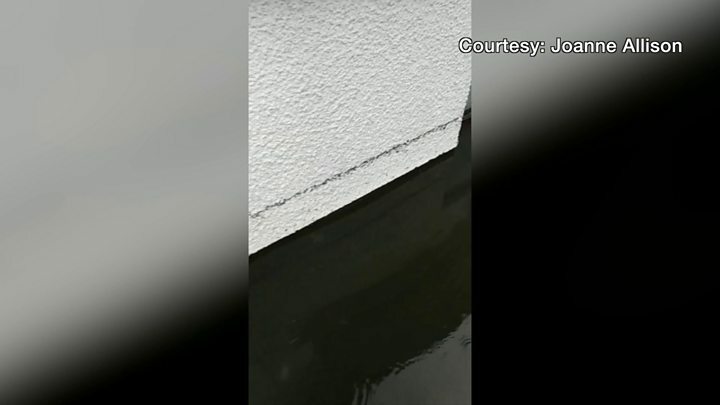 "Less than 10 minutes later, the water was coming in our back door." Mr Carson said he has lived in the house for 12 years and it has never flooded before. "I don't know why it was so different this time. I have decking out the back that's a foot high and within minutes the water was level with it." The Department for Infrastructure said two roads in Northern Ireland remained closed. Tree surgeons are working to remove a fallen tree from Dunmurry Lane in Belfast and Loughview Road in Crumlin is closed due to a mudslide. A number of elderly people had to leave their homes in the County Antrim village of Muckamore due to flooding. Muckamore resident, Florence Allison, told the BBC that at one stage there was more than one foot of water and sewage at her front door. "The carpets and all the flooring downstairs is ruined," she said. "My car was parked in the garage and it had seeped up through the doors. So you can imagine the height that it was in the garage when it actually went into the car. "It's just heartbreaking because you try and keep your house in good order. "It's just terrible and it's not only myself, there's other neighbours as well. I feel for them all." The severe weather resulted in at lease five flights being cancelled at Belfast International Airport, while other passengers complained of long delays at baggage collection. In Tenerife, Jet2 passengers who were due to leave at 21:00 local time on Saturday were still waiting to board a flight to Belfast on Sunday afternoon. Meanwhile, EasyJet customer Cathal O'Doherty told BBC News NI that he and up to 240 other Belfast-bound passengers were stranded in Naples Airport after an earlier flight from Belfast did not take off. Belfast International Airport's business development director, Uel Hoey, confirmed that for a short period on Saturday afternoon, ground staff had to stop working due to safety concerns caused by the "horrendous" weather. He explained that passengers could not be taken on and off aircraft when there was "thunder and lightning above the airfield". Mr Hoey added it was not the only UK airport to be affected and said his staff "did what they had to do to keep people safe".